ALEXANDER COUNTY, NC (January 9, 2018) – Broadband Internet service is becoming more and more of an essential component in citizens’ everyday lives and the daily operation of businesses. To help determine how Internet service can be improved in Alexander County, the county took bids for a Broadband Feasibility Study, and awarded the contract to Open Broadband LLC on September 11, 2017. 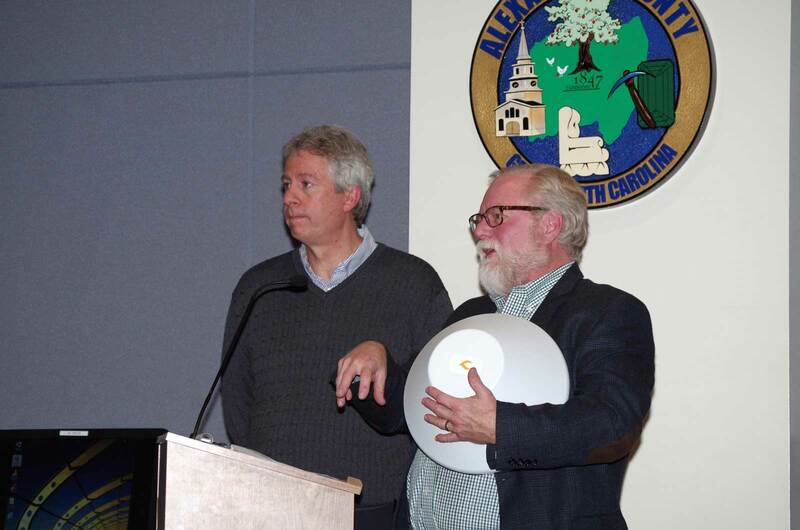 At the January 8, 2018 meeting of the Alexander County Board of Commissioners, the board was presented results of the feasibility study by Alan Fitzpatrick, CEO of Open Broadband, who noted that the current definition of broadband is 25 Mbps (megabits per second) download and 1 Mbps upload. “You have some good opportunities to do a lot with broadband,” Fitzpatrick stated. Fitzpatrick noted that a community workshop was held on November 13, 2017 at the CVCC Alexander Center for Education, with about 25 local business owners, education professionals, and others in attendance to discuss the importance of broadband and the hurdles that need to be jumped in Alexander County for the community’s future success. The outcomes of the workshop included: 1) broadband is important for economic development; 2) broadband is important to existing businesses because many are dependent on cloud storage; 3) new businesses require broadband; 4) broadband invites entrepreneurship opportunities; 5) broadband can help keep citizens working in their home county; and 6) broadband is essential in education to bridge the homework gap. Open Broadband completed a local broadband assessment survey in October and November 2017 to collect data about broadband availability, customer satisfaction with existing options, available infrastructure to expand broadband, and options for bringing broadband to underserved and unserved populations. He said the key findings in their broadband assessment was that Spectrum (Charter) provides broad coverage, but there are gaps in coverage, inconsistent speeds, and the service is not symmetric (download and upload speeds). The team also found significant fiber networks in Alexander County, but the corners of the county are not being reached. Fiber optics is a technology that uses glass or plastic threads/fibers to transmit data. In terms of copper lines, AT&T and CenturyLink offer little broadband service in the county. The assessment showed that two mountains, as well as several ridgelines, cell towers, and water tanks, could be leveraged for fixed-wireless Internet. Fixed wireless is similar to a satellite dish, with an antenna installed on homes/businesses that connect with a wireless signal from a tower. In addition, the existing fiber routes and vertical infrastructure offer a good opportunity to extend broadband into some portions of the county that are underserved or unserved. Fitzpatrick also noted that a local government cannot be an Internet Service Provider, but the county can make it easier for other providers by leasing available fiber capacity, allowing access to county facilities (water tanks, towers, etc.) at reduced rates, reducing barriers for ISPs to install necessary vertical assets, and making access to conduits and poles easier for new providers. The county hosted an Internet Service Provider (ISP) meeting on November 16 to express the county’s interest in improving Internet service for its businesses and citizens. ISPs in attendance included SkyLine/SkyBest, RiverStreet Networks, NC Wireless, and Open Broadband LLC. It was noted that representatives from Spectrum and AT&T did not attend. He said there are basically two options for extending broadband service in Alexander County: fixed wireless or fiber. With fixed wireless, the investment per user is about $250 and up to $10,000 per tower, which an ISP can justify based on demand with a payback period of only one year. With fiber, the cost is $36,000 to $65,000 per mile (ranging from aerial to underground) with other associated costs, translating to a 10 to 20 year payback period. The report showed that fixed wireless can attain Internet speeds of 25 Mbps to 100+ Mbps, which is ideal for streaming video, homework, and working with cloud applications. He said fixed wireless has a range of about 5 miles, but the signal can be repeated to hit the many underserved and unserved areas, including neighborhoods and rural areas. The recommended strategy from the broadband feasibility study includes attracting competitive ISPs, by providing access to county-owned property such as towers, buildings, and fiber assets. The study recommends seeding the competitive effort by offering Alexander County Government’s Internet contract to a provider in return for covering gaps in broadband coverage, making 100+ Mbps speeds available where feasible, and offering 25 Mbps service for approximately $30 to $40. The strategy also recommends applying for grant funds through the NC Broadband office, state elected officials, Golden LEAF, and others for broadband infrastructure. The strategy also includes an “innovation center,” which could be located in an existing building to support entrepreneurship and small business with high-speed Internet, up to 1 Gbps. Alexander County could also fund a pilot program (about $50,000) with a new ISP to deploy symmetric high-speed broadband in designated underserved areas. Finally, Alexander County should appeal to the incumbent ISPs (Spectrum and AT&T) to expand their 25 Mbps coverage areas. Fitzpatrick cited a 2015 FCC nationwide study that showed that 78 percent of the country has zero or one ISP. Commission Chairman Ronnie Reese said he is encouraged by the Broadband Feasibility Study. In the near future, county staff will continue to develop strategies to present to County Commissioners to move forward as they begin budgeting for fiscal year 2018-2019. The county will also have additional meetings with providers who have interest in providing broadband service in Alexander County, while working with the State Broadband Office along the way. Alexander County’s broadband initiative began in September 2016, when the Alexander County Broadband Committee was formed. The committee is comprised of county officials and staff, business leaders, and citizens, with the purpose of improving the access of Broadband Internet service in the county.